For the second time in less than two months, California Asemblymember Jim Cooper's 9th district will be targeted by a movement seeking a single-payer healthcare system in the state. The 'Knock Every Door' movement will have several volunteers going door-to-door in several key Assembly districts this weekend seeking to generate addtional support for Senate Bill 562. That legislation, which would initiate a single-payer healthcare system in California was approved last year by the California Senate, but further action was blocked by Assembly Speaker Anthony Rendon (D - Los Angeles) and has become clarion call for progressive members of the Democratic Party. Cooper, part of the so-called Mod Squad in the Assembly - more conservative leaning members of the Democratic caucus - has been targeted by Progressives. The posting organizing the canvassing efffort says "We're turning up the heat on Assemblymembers who are critical to the passage of SB 562 to make sure they hear from their constituents. 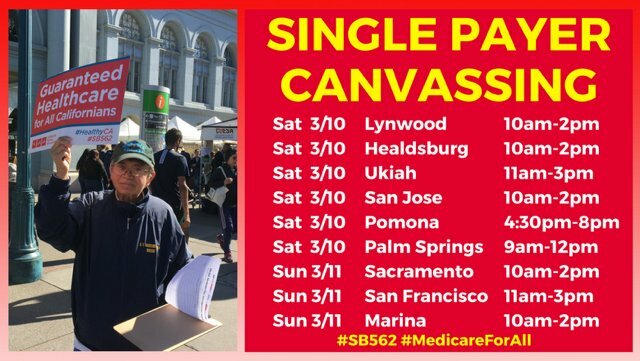 Join us on Sunday March 11 in Assemblymember Jim Cooper's district in Sacramento to talk to our neighbors about what Medicare-for-All could do for their lives and ask for their support." The ongoing effort is organized by the California Nurses Association and the Knock Every Door activist group, This Sunday the canvassers will converge on portions of a south Sacramento neighborhood that is represented by Cooper. During an Elk Grove town hall meeting held last July following Rendon's action, Cooper offered qualified support for a single-payer system. While Cooper said he supports the idea, he echoed the concerns of Rendon and other Assembly Democrats stating the Senate's legislation was not "fully cooked" in terms of financing. "We have to find a funding mechanism," Cooper said at the Elk Grove meeting. "How do we pay for it." The volunteers will go door-to-door on Sunday from 10 a.m. to 2 p.m. More information on the event can be viewed here. Cooper's district is one of nine districts targeted statewide this weekend alone.